Salt Spring Island is the largest and most populated of the Gulf Islands in the Salish Sea not far from the coast of Vancouver Island. 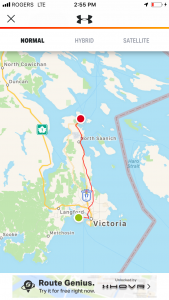 Three ferries service Salt Spring, with direct access from Vancouver, Swartz Bay (Victoria) and Croften. The island has a colourful population of artists, farmers and other weirdly wonderful personalities. The main town on the island is Ganges. 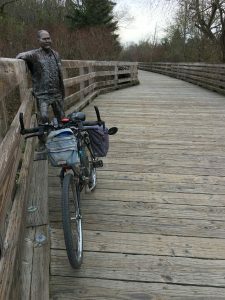 Last week we decided to test the theory that Salt Spring Island is only a bike ride away. By bicycle we reach the Swartz Bay Ferry terminal via the Lochside Cycling Trail. From home we have about 4 km of roadway to negotiate before hooking into the Galloping Goose, then the Lochside Trail. 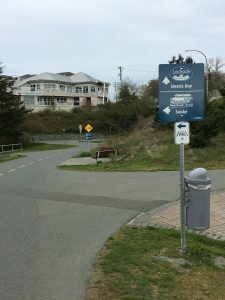 The Lochside Trail begins near Uptown Mall at what is known as the Switch Bridge that crosses the Trans Canada Highway at Carey Street but just to confuse, it starts at the km 4 marker. This little oddity caused a plethora of debate while we pedaled. We began cycling through the heart of the city, the other cyclists quite serious as they use the trail for daily commutes, but it doesn’t take long for the sounds of the city to fade. We soon found ourselves cycling first through suburbia and then countryside. For a while the trail joins up with a roadway, Lochside Drive. Real estate envy is a real thing here. “Oh Ray, look at that place,” I exclaim over and over. There are beautiful homes on the ocean along the route, but when the trail gives way to countryside, it’s the pastoral farms that elicit the most jealousy. You can cycle through the seaside town of Sidney, but the route recommends bypassing the downtown area. If you’re looking for a lunch spot we found the Waddling Dog. This pub is right on the trail and serves up great fish and chips with a large choice of beer on tap. 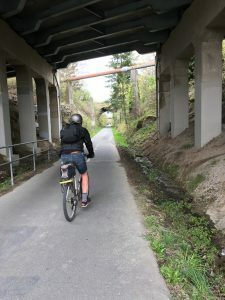 For other choices you might want to head into downtown Sidney, not far off the trail. 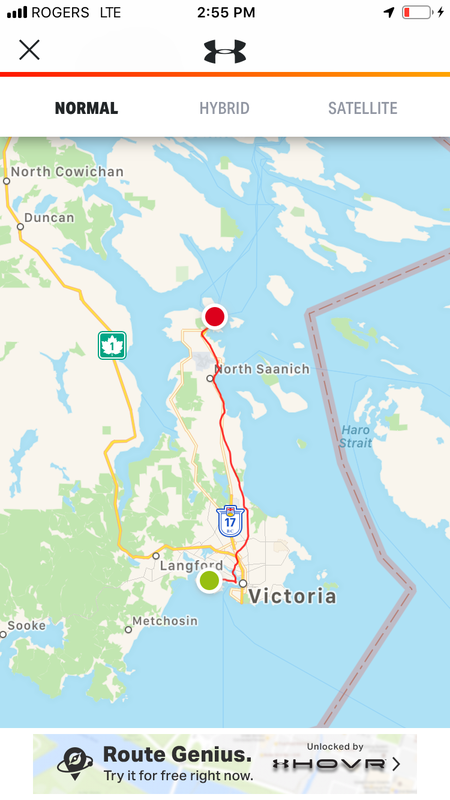 I’d like to say we’ve cycled the entire Lochside Trail now, but at some point past Sidney we lost it and found ourselves pedaling along the Patricia Bay Highway. There’s a good cycle lane here, but a ton of very noisy and impatient traffic. We figured we’d pick the start of the trail up on the way home, but somehow we missed it again. On the way to Salt Spring, the wind was at our back and the weather was beautiful. The 36 km took us about 3 1/2 hours including lunch. On the way home, that same wind was in our face, a wind so strong it threatened to shut down the ferries, and the rain decided to show up. It took us a little longer, about 4 hours. 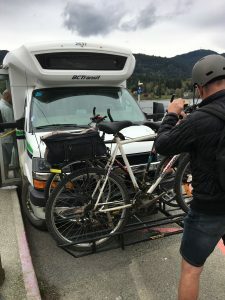 It’s a 35 minute, $28 journey by ferry from Swartz Bay to Salt Spring Island, and that rate is return. 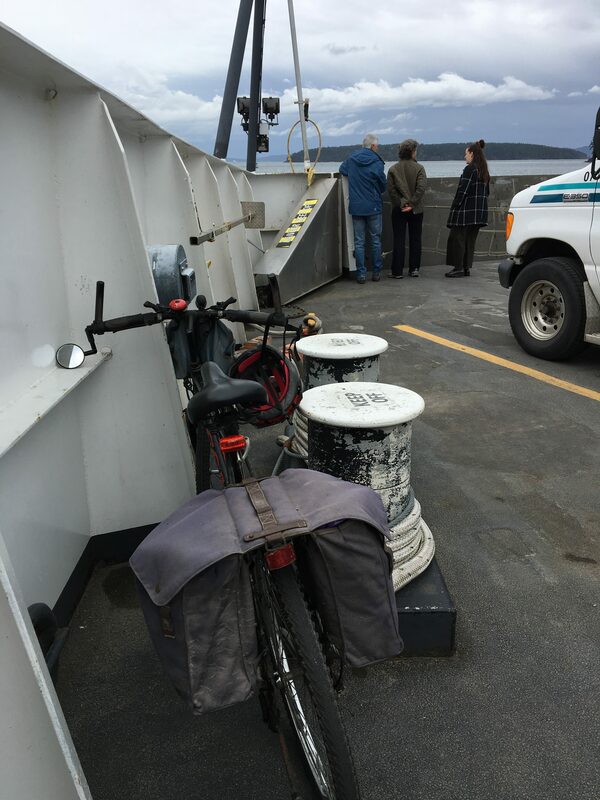 You’ll board with the foot traffic and leave your bike at the front of the boat. It’s a bare-bones ferry, no restaurant and most regulars just sit in their cars. There are seats inside to get you out of the weather. I met some fellow Manitobans on the crossing, a couple visiting their daughter who had defected to Vancouver. We didn’t, I don’t recommend it but you might as well be ready because you might have to. Nothing I’ve read recommends cycling the highway between Fulford Harbour, where the ferry lets you off, and the town of Ganges. Ganges is 14 km from Fulford Harbour, but the road is narrow with no shoulders, the speed limit is 80 kph and it’s hilly. Luckily, there’s a bus with a bike rack that costs $2.25 (but does not accept BC Transit transfers). The only problem is that there’s one bus per ferry and space for 2 bicycles. We eyed a third bicyclist warily on the ferry, but luckily he didn’t want to board the bus. I can’t imagine those spots are easy to get at high season. It’s the vibe here. There’s no doubt you’re on an island, a small, intimate island. To live here means to commit to a different way of life. 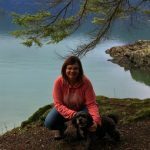 On the bus I sat beside a woman who works in Vancouver all week and was on her regular Friday afternoon commute. It’s a bit of a journey but she tells me she’s used to it, and it’s worth it. The bus was full. We made a few pick-ups on the way to Ganges, and the bus driver asked us all to cuddle up and make sure everyone had a seat. Luggage was passed around and balanced precariously on people’s laps. I’m sure there’s a ton to do on Salt Spring, but we have arrived after a long bike ride, on a cool spring evening with nothing on our agenda. We took a stroll through Ganges, the shops already closing at 5 PM. I can imagine this changes at the height of the tourist season, but this afternoon we’re mostly window shopping. The local dispensary was open so we stopped by. We had to show ID and then were ushered into the back room, where we bought some gummy candies. From there we were drawn to the Local Pub, in caps because that’s its name. A young man was playing his guitar, and wine just seemed the right thing to order. The pub is on the ocean, and I watched a few young hippies sitting on the rocks outside enjoying a joint before making their way back into the pub. We meant to enjoy more nightlife, but dinner at the Inn lured us into lingering, and that gas fireplace beside the big comfie bed was right upstairs. 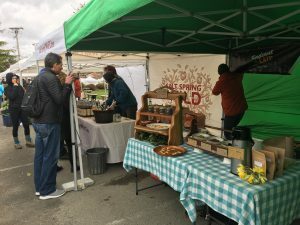 Part luck and part my excellent planning had us arrive on the eve of Salt Spring’s first Farmer’s Market of the season. In spite of a wet, dreary day the market was packed and what a market it is. 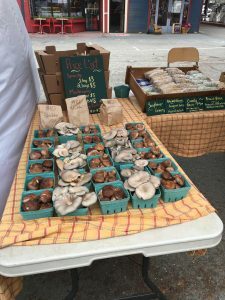 I’ve been to a lot of Farmer’s Markets; it’s kind of one of my things. This is the winner, hands down. I fell in love with Salt Springers. Everything in the market here is local, from vinegar to vodka, fungi to cider and kits to knit bumble bees. Art, food, drink, clothing, toys, jewelry – tent after tent after tent, absolutely fabulous! 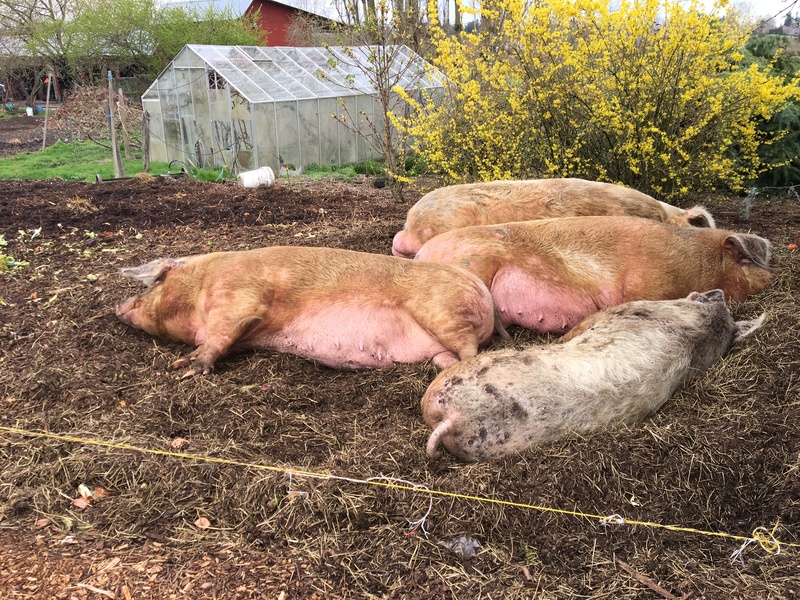 This has to be the highlight of any visit to Salt Spring Island. I’m told there’s usually buskers, but today was too cold. The rest of the town was open now, and it took another hour to visit the rest of the shops. We caught the 11:30 bus back to the ferry. 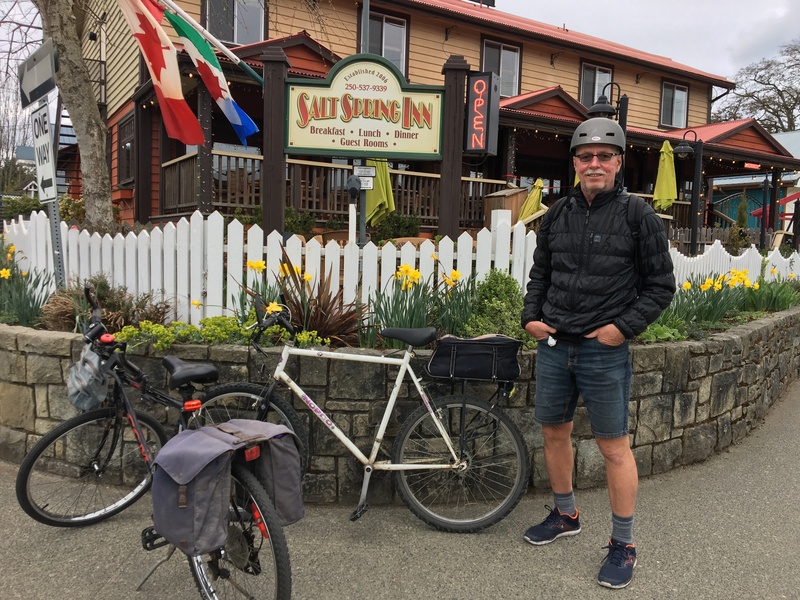 It appears Salt Spring island is only a bike ride away for us, and that’s just another cool thing about our Vancouver island home.